Fatgirl Hedonist: Mami's Cuban-ish Congri Recipe! This blogpost was developed in partnership with Imusa. All opinions expressed are my own. Noche Buena is almost here and the older I get, the more I realize I need to start learning my mom's recipes so I can someday pass them onto my son. So you can get used to more of my family's recipes posted onto my blog. The recipe I'll be sharing today is my mom's Cuban-ish Congri recipe, also known as Moros y Cristianos or Arroz Moro. It's called "Cuban-ish" because of the addition of bacon, because everything is better with bacon. - 3 Cups of "black water"
Rinse the beans and place them in a caldero along with 8 cups water, 1 teaspoon of salt and the 2 bay leaves. Bring to a boil, then reduce to a low simmer, partly cover and cook until tender, about 1 to 2 hours. Meanwhile, make your sofrito. 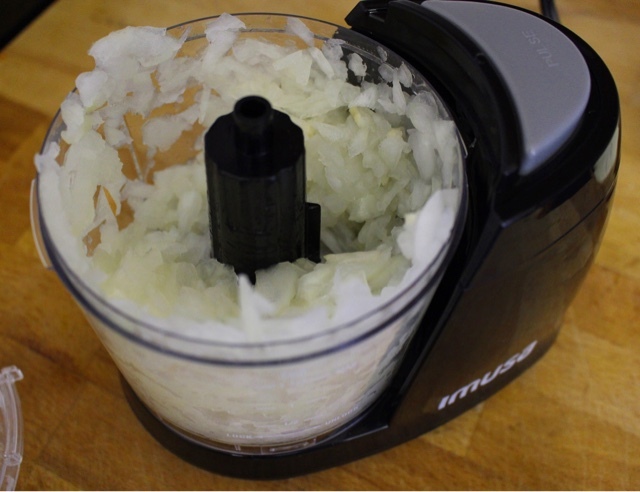 Chop your onion, garlic and green pepper and place into your food processor. Pulse until you reach your desired size. I personally hate giant chunks of green pepper and onion in my Congri, so I let the food processor run until they're minced. 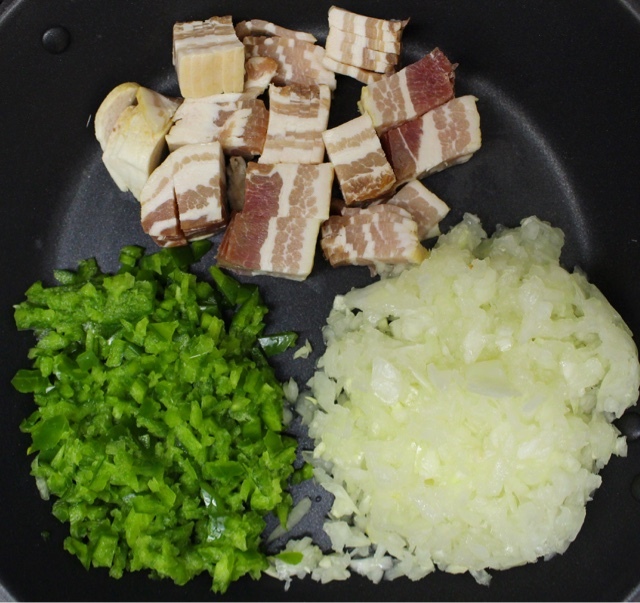 In a large frying pan add your sliced bacon, onion, garlic and green pepper. cook on medium-high heat until your veggies and bacon are completely cooked through. Once cooked, add the red pepper, black pepper and cumin. Stir until incorporated and set aside. Drain the beans, reserving 3 cups of the broth or "black water" and being careful to not break apart the beans. Grab your rice and rinse it. To rinse, place the rice in a large bowl, cover with water and swirl around. The water will get cloudy. Pour out the cloudy water, use a strainer to keep the rice from making a giant mess. Repeat until the water is clear. 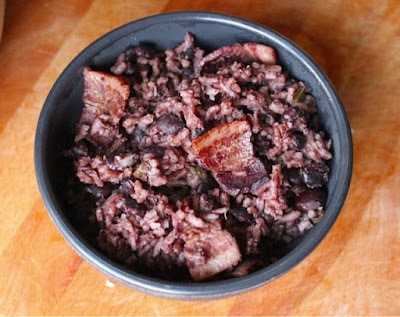 In the same caldero you just cooked the beans in, add the olive oil, rinsed rice, sofrito, black beans, "black water" and 1 teaspoon of salt. Bring to a boil, stir, then reduce heat to low, cover and cook for about 20 -25 minutes. Stir occasionally with a wooden spoon. Once the rice is tender, you're ready to eat! Be sure to check out Imusa USA on Facebook and on Instagram. 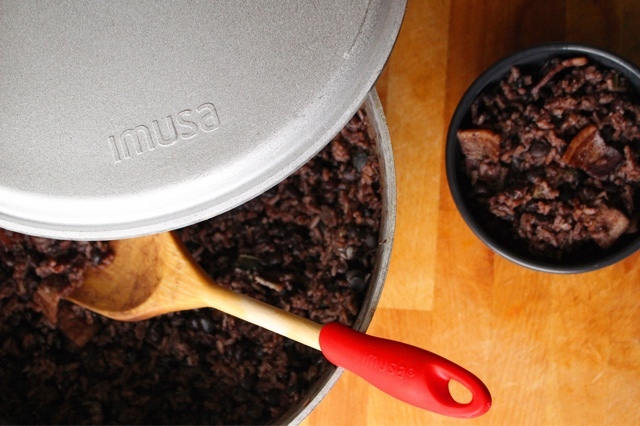 To get more recipes from Imusa, head here. Join in on the Noche Buena fun by sharing your favorite Noche Buena recipes/dishes on social media by using the hashtag #NocheBuenaConIMUSA. 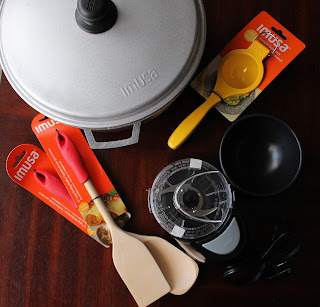 Thanks to Imusa for sponsoring this post and providing cookware that I used for this recipe: 1 cast aluminum natural caldero, 1 Electric Mini chopper food processor, 1 lemon squeezer, 1 wood 12” cooking paddle, 1 12” Serving Spoon and a salsa dish. My mom does the same thing! I have to shadow her while she cooks and write down everything! This sounds absolutely delicious! I can't wait to make it! This looks absolutely delicious! I can't wait to make it! I like to eat potato enchiladas with mole sauce!!! I like beef and chicken tamales. Congri,I've never made it, but I'm gonna try you recipe. Thanks for sharing it. I'd love to try this recipe! I also love pork enchiladas and tamales with queso. I love to eat pupusas on Noche Buena! I'm in SoCal, and Noche Buena is a 'thing' here. My sister-in-law's mother (who is Mexican) makes the most divine Tamales ever all during December. The ones that I love just have vegetables in them. I'd like to try this recipe. I'd just like to confirm for the beans, were they soaked in water for 24 hours prior, or pressure cooked to soften? I would like to make this recipe, however for the beans were they soaked in water 24 hours prior or were they pressure cooked?